Galerie Thaddaeus Ropac presents in its Pantin space a group exhibition dedicated to American Minimal art. Featuring over 20 major sculptures and paintings by Carl Andre, Dan Flavin, Donald Judd, Sol LeWitt, Robert Mangold and Robert Morris, Monumental Minimal addresses the many questions raised by the main protagonists of this artistic revolution. Started in New York in the 1960s as a reaction to Abstract Expressionism, Minimal art is characterised by a formal radicalism that breaks the traditional codes of sculpture. Seriality and the emphasis put on the concept, as well as the use of industrial materials, constitute the common base from which different individual practices stemmed. The works presented have been selected to interact with the architecture of the space. Whether placed on the wall, in a corner, or directly on the floor, the sculptures dialogue with one another and with the structural elements of the gallery in Pantin. The volumes of the former industrial building, together with its zenithal lighting, contribute to emphasising the primary structures of the works, in particular their form, colour and material. One of the main characteristics of Minimal art is to re-define the viewer's relationship with the artwork through exhibition display. 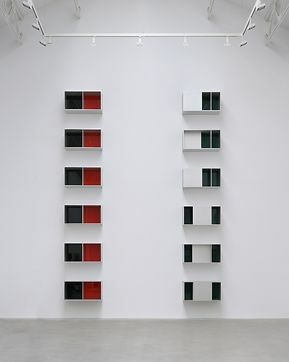 Indeed, the very status of the work is radically changed, as demonstrated by Donald Judd's Stacks, consisting of several identical elements mounted on a wall. The artist considers this series of work as neither paintings nor sculptures, but rather as "Specific objects", in accordance with the term he coined in his 1965 manifesto. Through its title, Monumental Minimal, the exhibition seeks to explore these sculptures’ ambivalent relationship to the notion of the monument and to classical sculpture in general. In this respect, the "monument" dedicated to Russian artist Vladimir Tatlin (1885-1953), created by Dan Flavin in 1967 is in a sense the chronological and conceptual starting-point of the exhibition. The stair-like arrangement of white fluorescent tubes evokes the colossal Monument to the Third International designed by Tatlin in 1920, yet never realised. This emblematic work demonstrates the importance of Constructivist theories in the development of Minimal art, and ultimately the true European rooting of an art often considered to be typically American. This exhibition continues the story that commenced with the presentation of works from the Egidio Marzona collection, one of the inaugural exhibitions at our London gallery in 2017. Indeed, Minimal art has always been the product of transatlantic influences and exchanges. A true admirer of Constantin Brancusi, Carl Andre has recognised the influence of La Colonne sans fin [The Endless Column], 1918, on the modular dimensions of his own works. A similar fascination with the Romanian sculptor led Robert Morris to choose him as the subject of his Master’s thesis at Hunter College in 1966. For Robert Mangold, who was inspired by Piet Mondrian’s paintings while a security guard at MoMA, these were the only modernist works that stood the test of time, as he himself progressively deprived his painting of any external reference, focusing instead on internal formal dynamics. At the other end of the exhibition’s timeline, Sol LeWitt's Wall Drawing #1176 Seven Basic Colors and All Their Combinations in a Square within a Square, 2005, has been specifically recreated for the Pantin exhibition with the help from the Estate of Sol LeWitt. This work pays tribute to the compositions of Josef Albers (1888-1976), a pioneer of the Bauhaus movement and, since the early 1950s, a key figure in bridging the gap between European modernism and American avant-garde. In convergence with Albers, LeWitt uses the simple geometric shape of the square to explore the illusionist effects of colour on a two-dimensional plane. He places a square within another square to study the interaction of the differing colours. As a result, the shapes seem to expand or contract as the visitor moves forward or backward. By merging spatial and temporal dimensions, the work reconnects with the very essence of minimal art as an experience both mundane and intense.